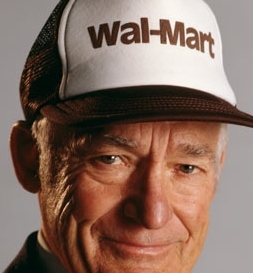 As I left the store, a blue shirted elderly woman sporting a warm smile said, "Thank you for shopping at Walmart.."For some reason, it struck me, "Wow, all this was started by one man, Sam Walton." I caught a bit of the Walmart story while flipping through the channels a few days earlier. Walton's wife said, "We were finally out of debt and living comfortably. But, that was not enough for Sam. He had an idea for a new store." A businessman on the TV program said, "I liked Sam. So, when he showed me his new store, I leveled with him. I said it was the worst store I had even seen and could never work. Thank God Sam did not listen to me." Sam Walton following his dream, passion and vision created a worldwide phenomenon employing two million associates in the U.S.; one man affecting the lives of mega millions. Wow! Patriots, like so many of you, I am extremely frustrated by the debt ceiling deal. We worked our butts off to get tea party candidates elected and the Republicans still caved. Our country is disappearing and this latest fiasco in DC left me feeling pretty helpless to change anything. But, that little old lady thanking me for shopping at Walmart, Sam Walton's legacy, reminded me of the power and impact of just one man. I felt inspired. I am only one man. Despite political betrayals, with all that is within me, I will stay diligent in my efforts to free my beloved country from this vile, tyrannous and evil enemy within known as Barack Hussein Obama in 2012. History is full of individuals like Sam Walton who changed the world. Patriots, each of us possess more power than we can imagine. Please, please, please do not give up. Stay committed to do your part to take back America. Like Sam Walton, one committed man or woman can make a world of difference.